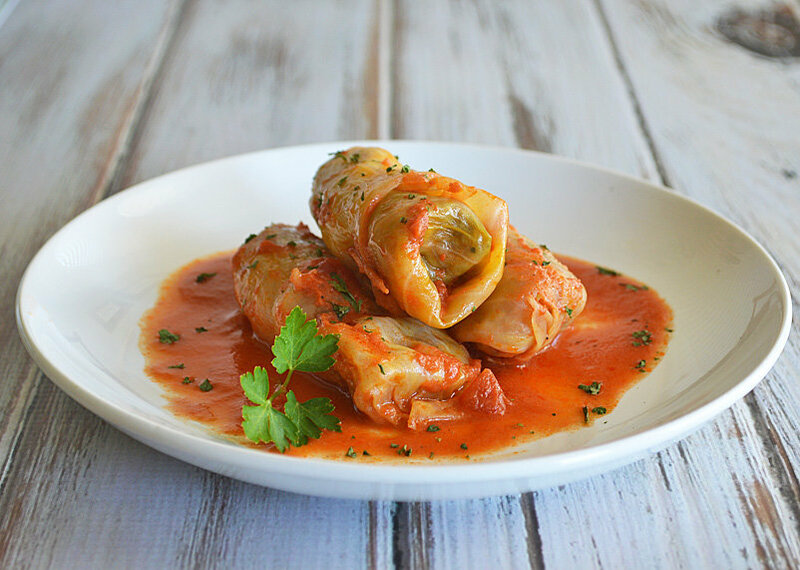 Cabbage Rolls, also known as Holupki, have got to be one of my all time favorite meals. My grandmother used to make them for us and we always looked forward to them. 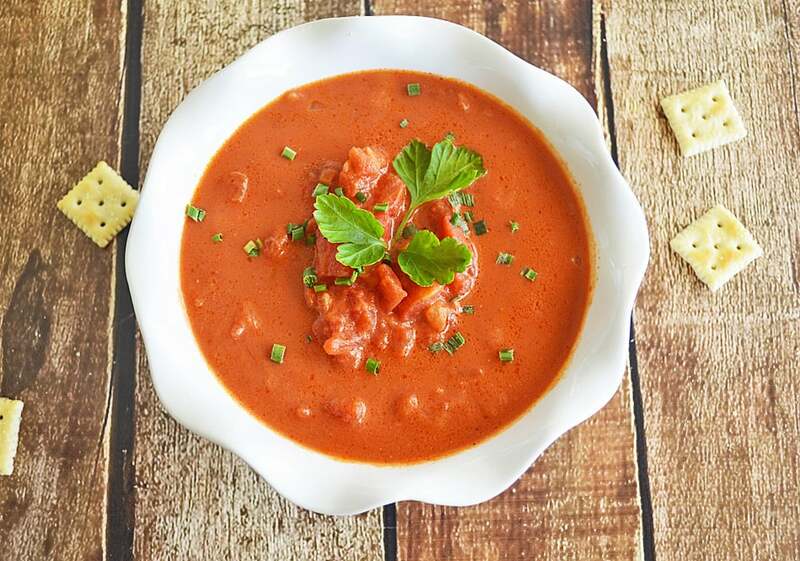 Hers were made with that familiar brand of canned tomato soup and crushed tomatoes. She used white rice and of course, back then…it was made with ground beef. These days, I use Beyond Meat Beyond Beef Beefy Ground Crumbles in this skillet version or (Gimme Lean if making the rolls) and brown rice. No canned tomato soup here. I make my own and everything is completely vegan! As much as I love the Holupkies, they are a bit time consuming. This is sort of a deconstructed version of that recipe. This is a one skillet meal (which I love) and takes less time. For the shorter preparation time, just use the crushed tomato recipe provided below. However, the dish really does benefit from the creamy, thicker texture of the soup recipe. 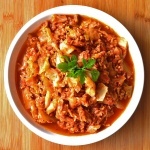 I’ll link the soup below if you want to try that, along with the original cabbage roll recipe. made with my homemade Homestyle Chunky Cream of Tomato Soup. In a large saute pan on high heat, add 2 Tbl of oil. Add sliced onions, stir until coated and cover. Stir every few minutes. 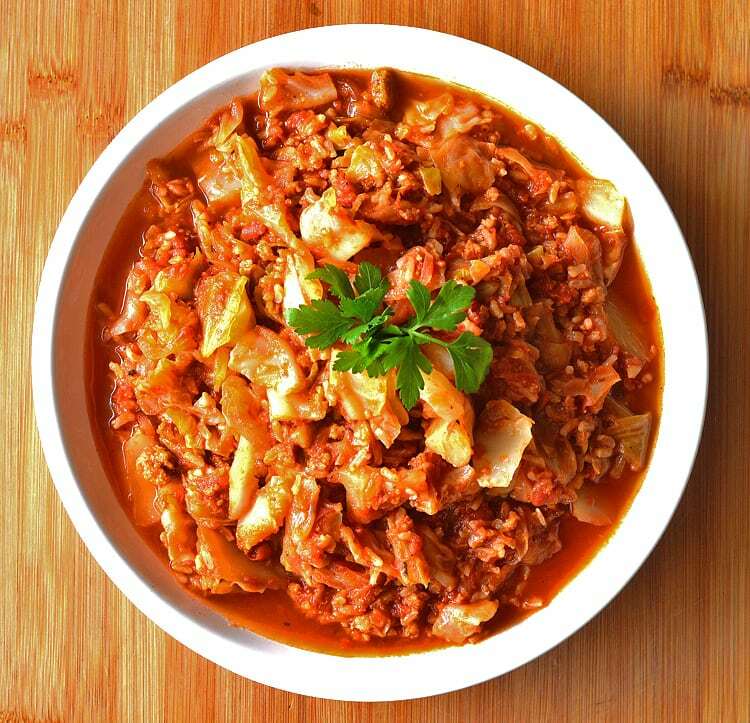 Once they start to caramelize, add the chopped cabbage and 1/2 C water. Cover and allow the cabbage to wilt, stirring every few minutes. Add the seasoning of your choice. Stir to incorporate. Add the crushed tomatoes, water and rice, stirring to combine. Simmer, covered on medium-low heat for 10 minutes. Add the ground crumbles. They just need to heat through. Cook uncovered for another 10 minutes, or until some of the water evaporates. Taste for seasoning. Add additonal salt if necessary. Do I have to use instant brown rice? Would regular white rice work? You can definitely use white rice, but I would pre-cook it. If I were to make your recipe- what would the steps be? Which would be eliminated? Hi. Firstly I am not currently a vegetarian nor vegan but would like to eat less meat than I do. I do not care for ‘faux’ prepackaged meat. What could I use instead? Lentil’s ? And if so which ones? Black beans? Thanks so much. Hi Roberta, you could definitely use lentils. Honestly, I’d just buy the canned version for simplicity since they are already pre-cooked. Another option would be chopped mushrooms or even a combination of the two!